Bring some floral touches to your next baby shower with these softly colored Flower Whirls. Dangling whirls are a great addition to our B Is for Baby shower collection. Use flower whirls to decorate the ceiling over a buffet table. 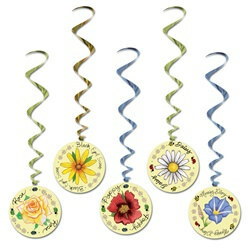 You can also organize a seating chart by flower for your party guests and hang a whirl over each guest table. Flower whirls also look fabulous at a spring themed occasion or a tea party.